The other day I enjoyed the melancholy privilege of sitting through two reels of supposedly jaw-dislocating comedy. “My comedies,” the producer was reported to have said, “are not to be laughed at.” Perfectly right. No one laughed at ’em. The trouble was that the producer did intend them to be laughed at; patently so—unskilfully so. At a banquet at Chicago Carl Laemmle, noted picture maker, was talking earnestly about his production and he clinched his point with, “And boys, our comedies are not to be laughed at.” We think we have seen that kind ourselves. Before Sam arrived in Hollywood, the official unconscious humorists were two brothers who made short comic pictures. The brothers became obscure; Sam became famous. The old anecdotes deserted the brothers and attached themselves to Goldwyn. “Our comedies are not to be laughed at” is one of the lines that abandoned the original author and joined the Goldwyn legend. The making of comedies is a serious business. From that day twenty years ago when one of the Stern brothers told a scoffing competitor, “Our comedies ain’t to be laughed at,” down through the ages the pursuit of the screen’s humor has been a pretty somber affair. In conclusion, the earliest instance located by QI was written by William Cox in 1829, and QI would tentatively credit Cox though he may have been repeating an existing joke. The later ascriptions to Samuel Goldwyn, Abe Stern, and other movie people were not well supported. 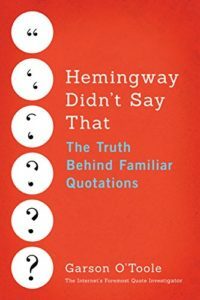 The remark was initially linked to unnamed movie producers, and QI hypothesizes that the 20th century attributions were made to entertain readers. Image Notes: Cropped image from page 33 of “Photoplay” magazine in December 1917. The caption says: “director Rex Ingram, with checkered cap and extended finger, tells the technical staff what to do next.” This image was used at the top of this article to illustrate the notion of movie making and is not directly related to the quotation.